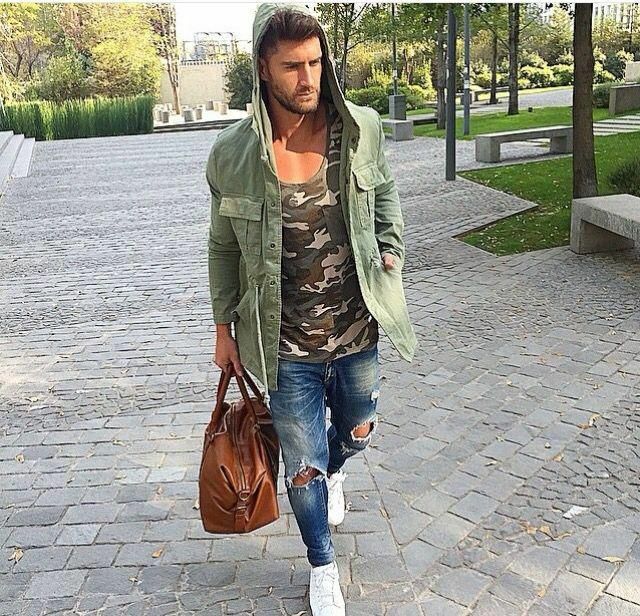 Men Ripped Jeans Outfits. Ripped Jeans are all about mixing casual style with some formal wear and creating a very classy look. Ripped jeans are not just trendy but help soften your look with some touch of elegance. Funky and creative, ripped jeans are loved by everyone. 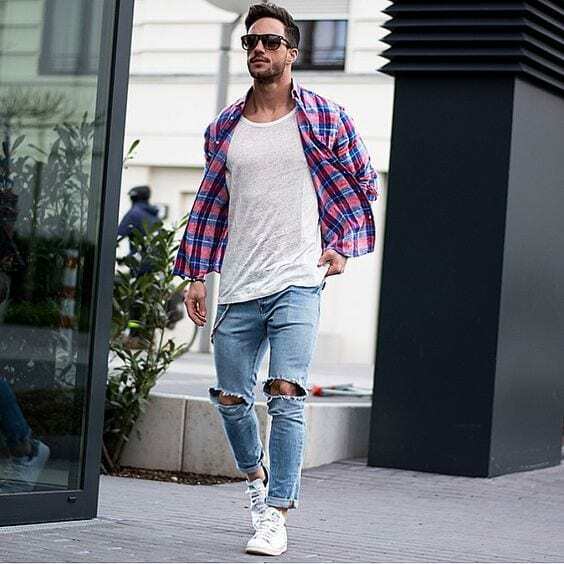 However, carrying these ripped jeans often comes out as a challenge for men as they are hard to fit into a routine outfit.You can get many ideas as what to wear with ripped jeans , how to wear it and what shoes to wear with distressed jeans . One of the best thing i love about this outfit is that you can always make these jeans yourself . There are many DIY ripped jeans tutorials that you can do it with easy to your old pants. Ripped jeans or distressed denim pants are essential for a charming and attractive look. Here are some styling ideas in which you can add them to your casual wardrobe and make it pop out with class and sophistication. This ripped jeans look is easy to pull off and comfortable to wear. just wear a plain white top and throw over a checkered shirt to add some class to your ripped jeans look. This look is the ultimate depiction of class and sophistication. Pair your ripped jeans with smart waistcoat and a formal suit coat. 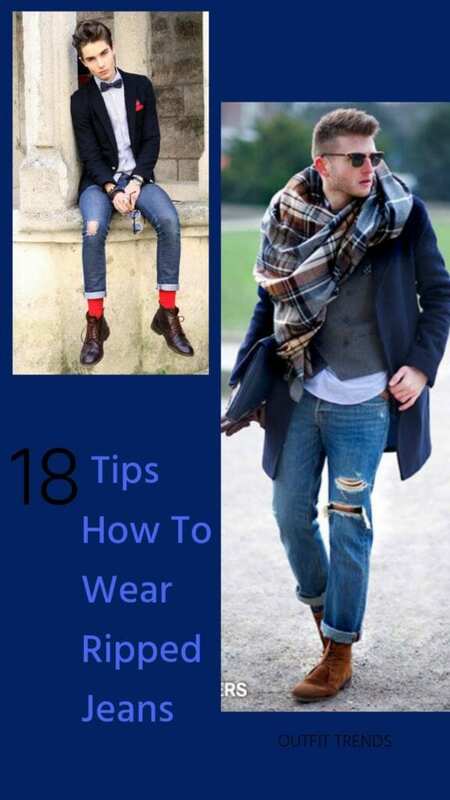 Throw a classy checkered scarf and you are all set with the picture perfect look. Adding a simple overcoat to your routine will definitely help you accentuate your look to the next level. Complete your look with a classy pair of shades and your ripped jeans outfit is all set. This simple yet classy look is incomplete without these boots and a derby hat. This must have items are a must to complete this classy look. Sophistication and Class is incomplete without this formal coat. Complete your outfit with muffler and some nice pair of shoes. The must-haves to complete your look, ripped jeans with denim coat, stylish watch and loafers. Pair your black knee ripped jeans with a plain black shirt to complete your casual look. Pair your ripped jeans with this amazing tortoise shell shirt and a green hoodie. Add some attitude and your look is complete for the day. There is no pair perfect than that of canvas shoes and ripped jeans. Wear some classy shades and your look is no less than that off a runway. Wearing a leather jacket over your ripped jeans will definitely take your style up a notch. Your ripped jeans outfit is incomplete without a Beanie. Give your outfit a softer look and you are all set with a completely perfect look. These products are a must-haves for your wardrobe to complete your look with ripped jeans. Biker Gloves and Bowler hat is all that you need to complete your rock star look. This red and blue checkered shirt is all that you need for a sophisticated and classy look.